The choices we make in planting our gardens can have positive impacts on the local wildlife, a point that has become familiar to many as they develop habitat gardens. Most are created with the goal of attracting birds and butterflies. 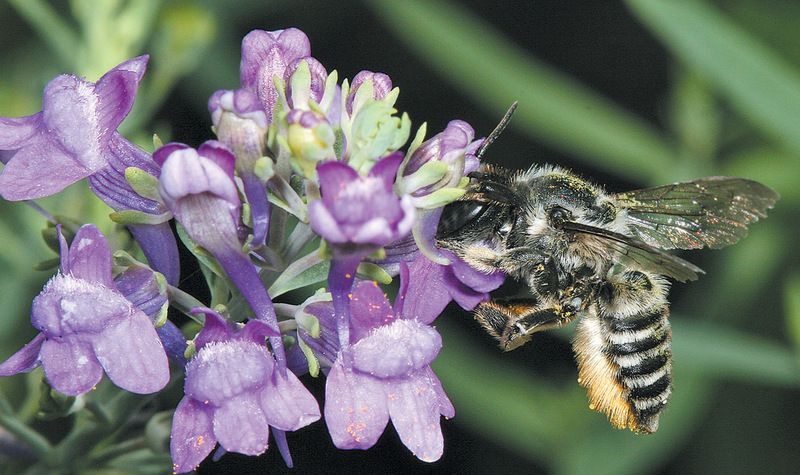 Another group of skillful fliers that inhabit nearly every garden also deserves consideration: native bees. They provide us with the essential service of pollination and are the most effective pollinators we have. Gardens can be easily designed or modified to attract these important winged visitors, which come in an array of shapes, sizes, and colors and are fascinating to observe. A garden built for bees will most assuredly attract other visitors as well, since butterflies prefer nectar from many of the same flowers, and birds like to feed on seeds and fruits from flowers pollinated by bees. To build a garden for bees, you must first think like a bee. A bee needs food in the form of nectar and pollen. Adults drink the sugary nectar as a source of energy that keeps them buzzing throughout the day. Pollen is rich in protein and vitamins; bees combine the two substances to form a “bee loaf,” which they provide for their larvae to feed on during their development in the nest. To entice bees to visit their flowers and carry out the important process of pollination, bee-pollinated plants provide resources in the form of nectar and pollen. Some plants, such as those in the composite family (Asteraceae), provide both and are important to include in a bee garden; composite flowers usually offer a broad landing area, upon which a bee can both sip nectar and collect pollen. Other flowers, such as most of the mint family (Lamiaceae), are a good source of nectar; a bee will hang off the sides of these flowers and insert their proboscis (tongue) deep into the flower to gain access to the sweet nectar. Still others— California poppies (Eschscholzia californica) and bush anemone (Carpenteria californica), for instance—provide pollen as their only resource; bees literally dance on brightly colored anthers as they collect the pollen. A bee also needs a place to build a nest. Roughly seventy percent of California’s native bees are solitary ground nesters that dig their nest holes in bare soil or beneath a thin layer of leaves. After mating, females search for the right place and soil type to begin their nests; that might be under plants or on the sloping sides of mounded planting beds. It’s the female’s job to build and provision the nest; the males are too busy looking for more females. The other native bees are cavity nesters; most look for pre-made holes in pithy plant stems, abandoned beetle holes in tree trunks, or pre-drilled holes in wooden bee blocks set out for them. 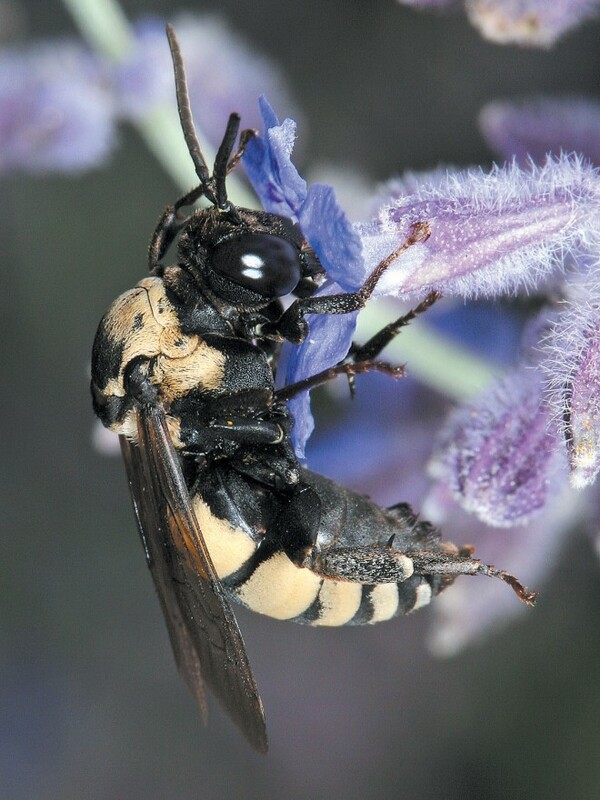 Carpenter bees make their own nest holes by excavating wood with their mandibles; they prefer untreated wood and are sometimes found nesting in wooden garden trellises. These solitary bees have a distinctly different lifestyle compared to that of the social honey bee, which is active year round in mild climates. Native bees are only active for a short time during their season. They emerge from their nests at different times of the year, some beginning as early as late January and February; others come out in spring, early summer, or late summer. The lifespan of a native bee is relatively short once it emerges from the nest; males live only a few weeks, and females perhaps a month or so. The female dies after building her nest; her young will over-winter and emerge the following year. 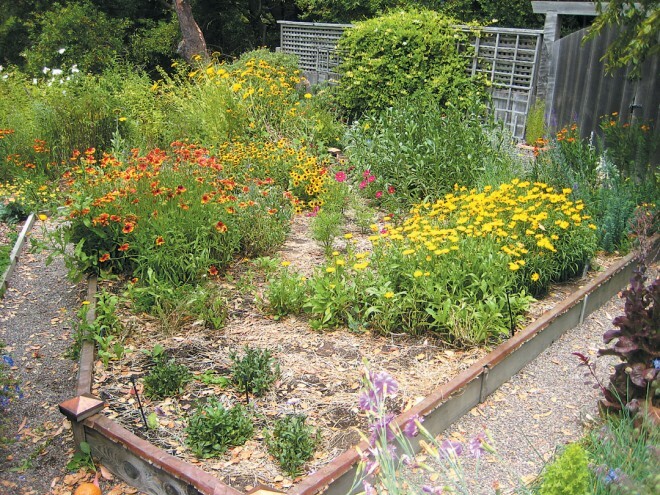 In the course of our research in many gardens throughout California, we have found that bees favor large patches (at least ten square feet) of any plant, rather than a single specimen here and there. 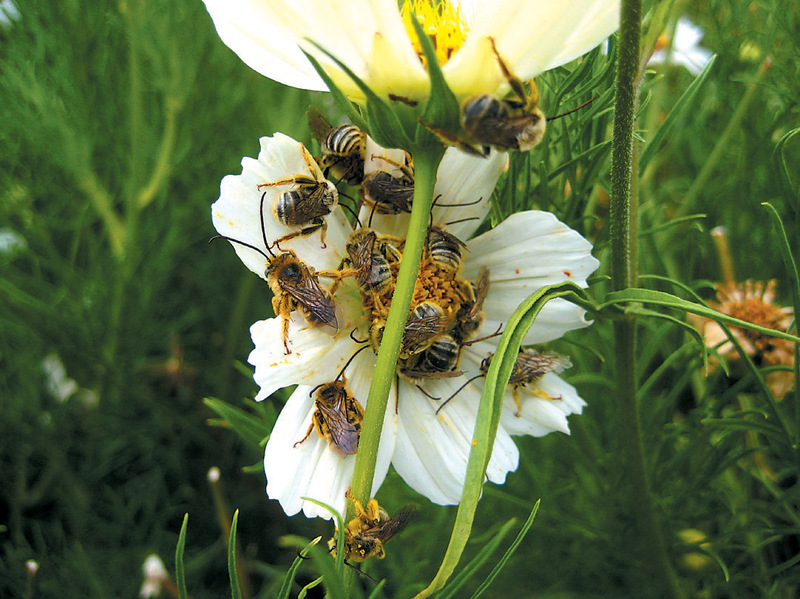 A lot of bees exhibit floral constancy, which means they feed on only one or a few kinds of flowers on each foraging trip; a large patch will cut down on the time they need to search for the right flowers, and will keep them busy foraging for a longer period, which also makes it easier to observe them. A large garden can support more wildlife of all kinds, but even smaller gardens can attract bees. For small gardens, focus on plants from the two plant families, Asteraceae and Lamiaceae, most attractive to bees, and try to incorporate small patches of at least fifteen kinds of plants. Choose plants that will overlap in flowering from early spring through late fall; place larger shrubs towards the back and smaller plants in front to make it easier to observe the activities of the bees. If you want bees to establish in your garden, provide nesting spaces for them. Ground-nesters prefer bare soil or a light leaf litter similar to that in wildland areas, so it’s important not to heavily mulch your garden. Mulch does play an important role in the garden, as it helps reduce moisture loss and keep weeds at bay, but a thick mulch may discourage ground-nesting bees that can’t dig through it. We suggest mulching directly around plants you want to protect, but leave some areas mulch-free and wild. 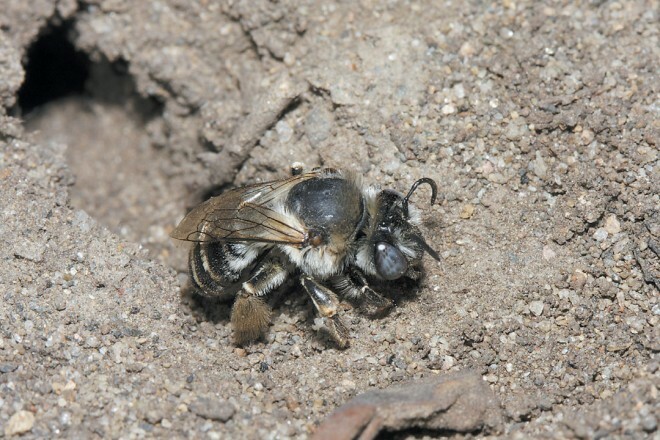 To encourage cavity-nesting bees, you can put up wooden nest blocks (many websites give instructions on building and managing them), and let stand old stems of sunflowers and other plants with pithy or hollow stems; cut the faded flowers off, and the stems will hollow out as they dry, providing great nesting sites. Remember that the bees may be in them for almost a year. Maintain your garden as it transitions from spring through summer to fall. Deadheading spent flower heads encourages plants to flower more prolifically over a longer period. Use organic fertilizers to encourage more flowers on plants that are heavy feeders. Do not use any pesticides, as they kill beneficial insects, like bees, as well as the pestiferous ones. Natural homemade remedies can be made of non-harmful ingredients that work just as well as synthetic ones. Since some bees, like bumblebees and miner bees, will emerge from their nests in January and February, it is important to have flowers in bloom at that time. This is the season when native plants take center stage; adapted to our mediterranean climate, many of them begin flowering early in the year. Among the important early flowering natives are manzanita (Arctostaphylos spp. ), California lilac (Ceanothus spp. ), black sage (Salvia mellifera), Brandegee’s sage (S. brandegeei), and tidy tips (Layia platyglossa). For later in spring, consider tansy phacelia, gumplant (Grindelia hirsutula and G. stricta), California poppy, and foothill penstemon (Penstemon heterophyllus). Visiting these flowers will be bumblebees, digger bees, sweat bees, and long-horned bees. As spring turns to summer, the garden must also transition to include summer-flowering natives like bush sunflower (Encelia californica), seaside daisy (Erigeron glaucus ‘Wayne Roderick’ or ‘Bountiful’), blue globe gilia, and buckwheat (Eriogonum fasciculatum, E. grande var. rubescens, E. nudum). Non-native plants become important as native plants finish their season; consider bidens (Bidens ferulifolia) and mint relatives such as lavender (Lavandula spp. ), catmint (Nepeta spp. ), bog sage (Salvia uliginosa), and calamint (Calamintha nepetoides). Some of these plants will flower for more than one season, especially if they are carefully deadheaded and irrigated. Late emerging bees visiting these flowers include leaf-cutting bees, ultra green sweat bees, wool carder bees, and cuckoo bees. 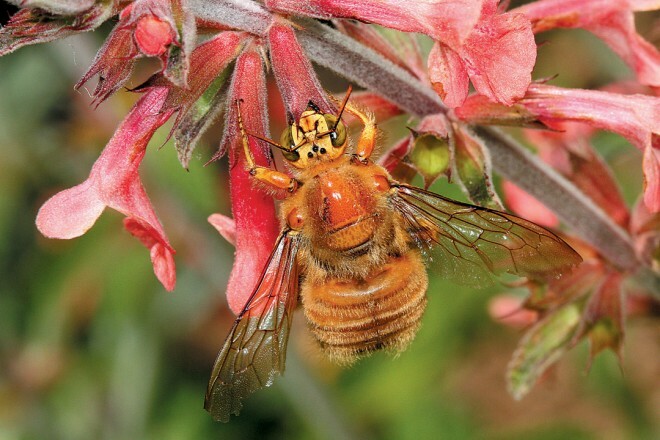 When most native plants are no longer in flower in fall, non-native plants step up to offer important resources for bees. Some non-native ornamental plants have been bred to be showy and attractive to us, but have proven less so to bees. 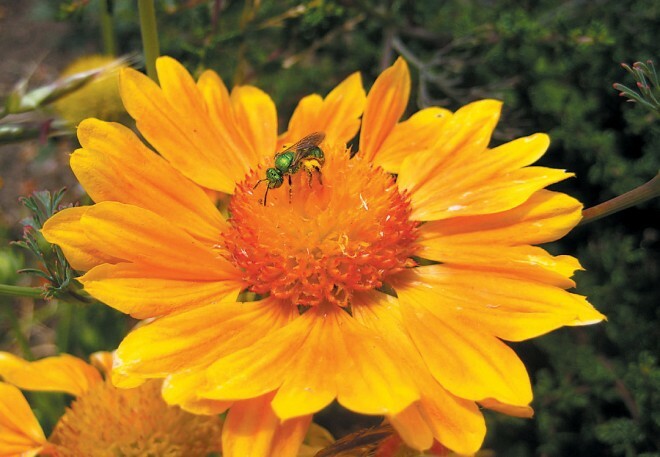 However, our research has found that well-chosen non-natives do attract a variety of native bees: cosmos, blanketflower (Gaillardia &times;grandiflora), black-eyed Susan (Rudbeckia hirta), bluebeard (Caryopteris incana), Monch aster (Aster &times;frikartii), and toad flax (Linaria purpurea). Though many bees have finished for the season, leaf-cutting bees, long-horned bees, sweat bees, carpenter bees, and miner bees will appreciate these flowers. In most cases, it will take more than one season to realize the success of your plantings. The biggest piece of advice we have is to get out there and observe! It is one thing to buy the plants, incorporate them into your garden, and then nurture them into bloom, but it is quite another to do some close observations of the bees visiting them. On a warm sunny day with little or no breeze, grab a comfortable chair and sit in front of a big patch of flowers in full bloom. Are there any visitors? Are they stopping to sip sweet nectar or are they zooming around the large patches? Can you see brightly colored pollen packed on the legs or the undersides of bees? What colors are the bees and what sizes are they? Do you see any bees digging nests in the bare soil? Are there other visitors like butterflies, wasps, and beneficial flies? Once you slow down and come to their level, you will realize that there is an entire world of interactions taking place in your garden. Make notes on which plants are the most attractive and record what resources the bees are receiving from them—either nectar, pollen, or both. Experiment with different native wildflowers to see which are the most attractive in your specific area. If something isn’t working in your garden, try something else that might fill a niche. Gardens are dynamic, always changing. Practiced gardeners adapt in small ways and sometimes orchestrate bolder changes in their gardens by paying attention not only to the plants but to their animal companions as well. Identifying the bees that visit your garden can be a daunting task, and there are no field guides to help you do so. One is in the works, however, from UC Press, and it will help you identify both the most common bees and their preferred flowers. Until then, happy bee gardening!